Summary: The Inwater Research Group has two established marine turtle projects in important developmental habitats in the central and southern part of the state. 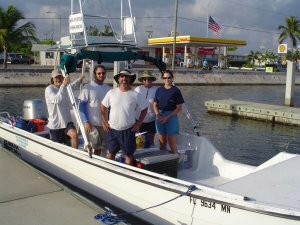 One project is in the southern portion of the Indian River Lagoon System and the other is in the Key West National Wildlife Refuge. These projects have a proven record of success and generate data on the genetic origins, disease rates, spatial distributions, relative abundances and size distributions of three species of sea turtles found in Florida waters. Critical to the continuation of these projects is the procurement of a reliable research vessel. This proposal focuses on the need for a custom boat, specifically designed for sighting, netting and capturing sea turtles. Boats that had been borrowed previously are either in disrepair or no longer available. Other funding has been sought for these projects, but none addresses the need for a solid research vessel. Funding this proposal will ensure that the collection of data important for the management and conservation of Florida sea turtles continues into the future.